Can you believe it? 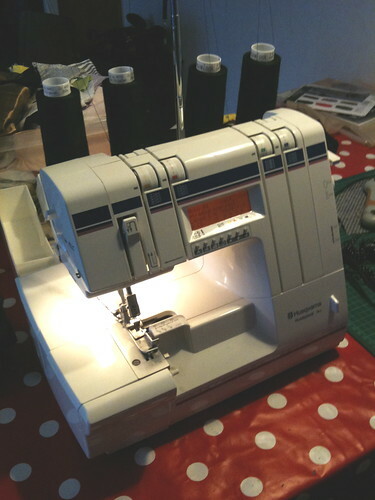 I have got myself a serger! Yay! I´ve been saving up for this for quite a while now, and finally, the day came when I could go out and buy this beauty. She´s a pre-loved Husqvarna Huskylock 910, and great things have been said about her at Pattern Review. One of my local sewing machine shops have an updated online list over used sewing machines they are selling, and this beauty had been on the list for quite a while. Yesterday, I went out to see if she was still there, I even got nervous that everybody else out on the streets of Uppsala was heading to the sewing machine shop, so I walked kind of fast (haha)! But, it was only me. Me, the seller and the machine. 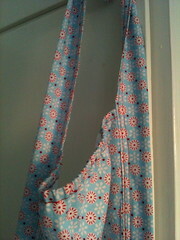 I got the sewing machine guy to give me a short rundown about how to thread her, and I got her home freshly threaded. At the moment I only have black and white thread, but you can come a long way with that:-). As you see in the pic, she´s threaded with black thread, but I used the great tip of just cutting the thread, and tie the old color to a new one when I shifted to white, and that worked like a charm! I used the machine for some different projects yesterday, and it didn´t fuzz at all. One of the best things about this machine is the digital display. It tells me exactly what to do with different kinds of materials and seams, and it really eliminates all tension trouble quite nicely! You see? 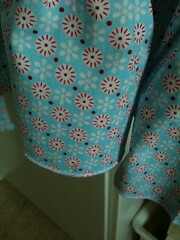 I can now make a rolled hem! 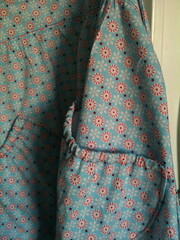 Now, I hope you are all enjoying the weekend, I´ll go back to my serger! Oooh! Fabulous! Hello pretty new serger!! I am very pleased with her, everything just looks much more neat and pretty on the inside! And I must say, it´s quite fun to see the blades in action!